George R.R. Martin writes sword-and-sorcery which concentrates on the swords. 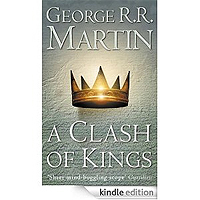 A Clash of Kings is the second volume of A Song of Ice and Fire, the sequence which began with A Game of Thrones and will take another four volumes to complete. The Seven Kingdoms are divided by revolt and blood feud; beyond their Northern borders, the men of the Night Watch fight the coming of a great cold and the walking corpses that travel with it; on the other side of the ocean, the last of the Kingdom's deposed ruling house mourns her horseclan husband and rears the dragonlets she hatched from his funeral pyre. If you want clean cut heroes, buy another book. Every character is more venomous than the last. You find yourself unwillingly fascinated by the depths of brutality and depravity that even the most amiable can reach. And for all that, I couldn't put the evil thing down. For every horror you suffer you're rewarded with a stroke of humanity that seems all the more poignant against the dark backdrop.